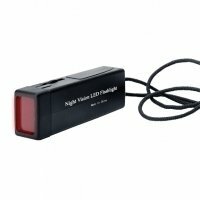 This voltage regulated LED flashlight supplies night vision protecting red light for map reading and telescope operation. Adjustable for brightness, its included 9-volt battery provides up to 625 hours of operation. Sky-Watcher 5mm Long Eye Relief (LET) eyepiece.